Students who attend the college are just now finding out about the closure. Students who attend the college are just now finding out about the closure. A desk administrator with the college in Greensboro said the college will close their doors on December 19. The last day for medical students is December 7, and for culinary students is on December 18. Then the campus will officially close to all on December 19. According to the desk administrator, every Education Corporation of America 'career campus' is closing, and Greensboro is one of 46 campuses. WFMY News 2 observed staff members and teachers rolling out their desk supplies, some in tears. Most students we spoke with said they are shocked and upset with the abrupt closing. Students are concerned their credits won’t transfer to other colleges since Virginia College offered 9-month courses on a fast-track. "I am really upset, really upset," Shaketha Barnard said with tears streaming down her face. She was about 50 credit hours away from earning her degree. Now she'll never get that chance. She's now walking away without a degree, and instead, with debt. "I figured once I stared working I'd be able to pay those student loans off gradually like anyone else, and now with no degree and no diploma period I wont be able to do that and that’s not helping me," Barnard said. Barnard wanted her daughter to see her get her diploma. "I wanted to be able to show my daughter something different, I was looking forward to walking the stage, I have a 4.0 GPA." Edward Kirby is feeling the same emotions. He was excited to walk across the stage in January for the commencement ceremony. That ceremony has now been canceled. "That hurt, that’s what I was looking forward to," Kirby said. "I’ve been through so much college so many different schools that didn’t work out, then I found out about Virginia College and it worked out for me, and I wanted my family and my great grandma to see me walk across the stage and now I don’t even get that." 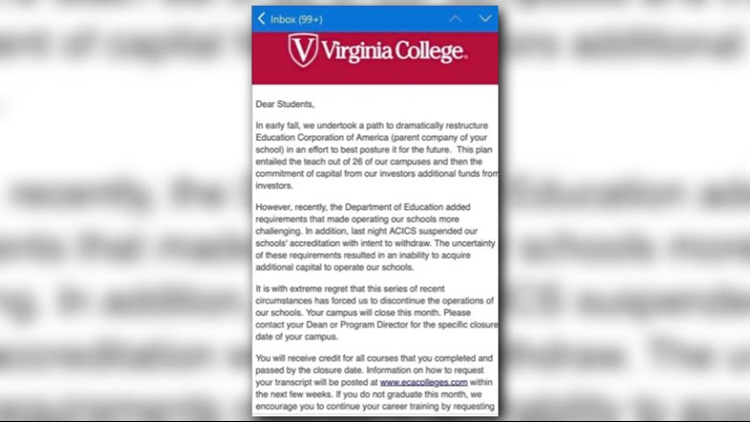 Education Corporation of America; the parent company of Virginia College didn't immediately answer our questions as to whether or not student credits will be transferable to other colleges, or if they'll be issuing refunds. "After many years of training students for new careers, it is with a heavy heart that today we announce that Education Corporation of America (ECA) is closing all its career colleges effective with the completion of the current module or term for nearly all students. We will work with students to ensure access to their transcripts so they can complete their studies at another school. We are proud of our thousands of graduates who have entered the workforce with skills they acquired at our schools along with our faculty and staff who have shown unwavering support for our students. This is not the outcome that we envisioned and is one that we recognize will have a dramatic effect on our students, employees, and many partners." Virginia College sent out this email to students, explaining the sudden closure. The college cites losing its accreditation and financial woes. Those who have graduated are encouraged to get their diplomas in person before the December 19 closure date in Greensboro. Transcripts are also available to retrieve up until that date.